I’ve been excited about this one for awhile. Tonight, the Lucas Oil Late Model Dirt Series unloads in Maribel, WI. 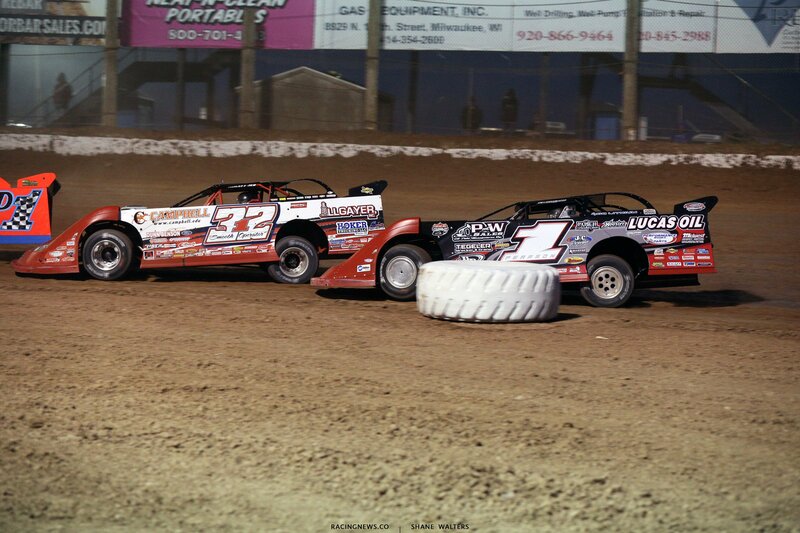 141 Speedway, a 1/3-mile clay oval is set to host the national dirt late model touring series. View full 141 Speedway results below. Jimmy Mars wins hot laps. Bobby Pierce takes the pole! 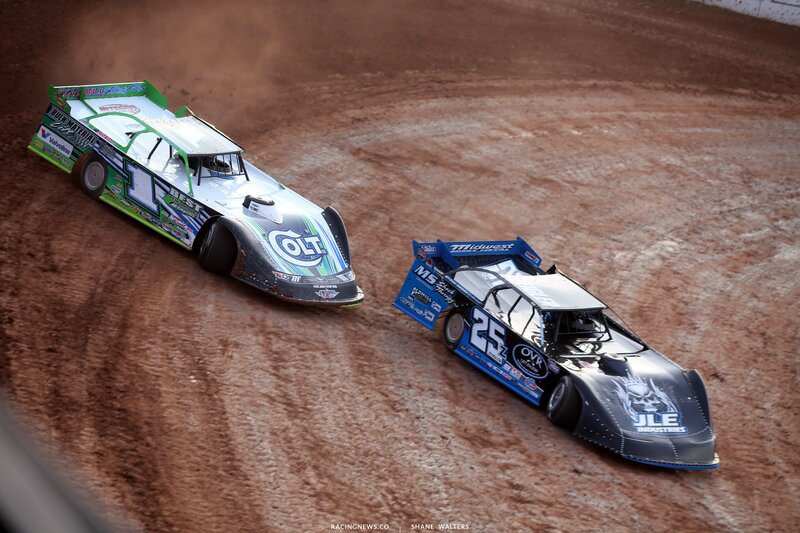 O’Neal and Bloomquist battle for 2nd. They make light contact in turn 4. 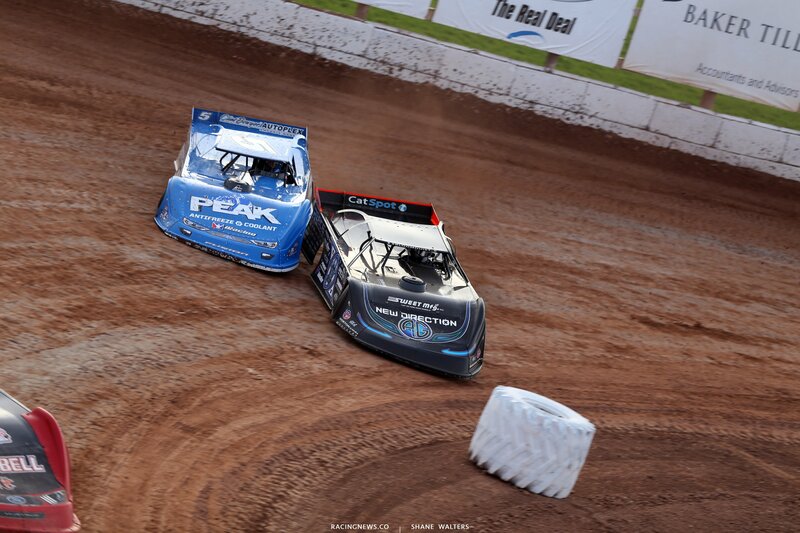 Bloomquist gets sideways but hangs onto it. Bobby Pierce checks out to win heat 1. Mason Zeigler and Allen Murray trail the pace truck ahead of heat race number two. Green, Zeigler wins the race into turn 1 on the bottom. He pulls Richards with him from 3rd. They both head to the high side. Richards is making up ground quick. He closes to his rear bumper. Richards was setting up a slider in turn 3, Zeigler heads to the bottom and Richards pumps the brakes. Richards regroups to mount another charge. He slides Zeigler in turn 1. He’s clear. Zeigler fights back in turn 3. Zeigler slides across the nose of Richards. Minor contact at the front. Zeigler reclaims the lead. Zeigler holds on to win heat race number two. Hudson O’Neal and Nick Anvelink set the front row in the final heat race of the night. Green, O’Neal jumps right to the top in turn 1. False start. Green, this time Hudson O’Neal runs the middle in turn 1. Davenport looks to the low side in turn 1. He pulls to the number of O’Neal but O’Neal powers to the lead off turn 2. They run 3 wide down the back for 3rd. O’Neal and Davenport run identical lines around the high side of the track. The gap remains at 2-3 car lengths. Hudson O’Neal wins the third and final heat race of the night. Bobby Pierce and Mason Zeigler will lead them to the start. It’s a 50 lap main event around the bullring race track. 4 wide salute for the Wisconsin dirt track racing crowd and we’re going green. Green flag, Pierce wins the race to the bottom in turn 1. Hudson O’Neal to 2nd. Pierce has caught the tail of lapped traffic in no time. Hudson has a run off turn 4, he looks low into turn 1. Pierce holds the line and the position. Pierce is around the lapper. Hudson O’Neal is under pressure from Richards. Hudson is exploring the track. Most of the field is glued to the bottom. Lap 26, Luke Goedert is around down the back. Caution. Green, Pierce gets the jump. Richards heads directly to the cushion in turn 1. He carries way more momentum than Pierce. Richards is at his right rear off turn 2. Richards powers by on the outside down the back. Pierce dives it in on the bottom in turn 3. Richards struggles to get the power down on the high side. Pierce drives back by on the bottom. They continue to run side by side multiple laps later, Richards fades. 10 laps remain, Pearson has climbed to 2nd. Pierce is deep in lapped traffic and Pearson is all over his rear bumper. 5 to go, Pearson is through! Pierce is exploring the high side for the first time all race. The dust flies as he tries to find anything to get back to the leader. 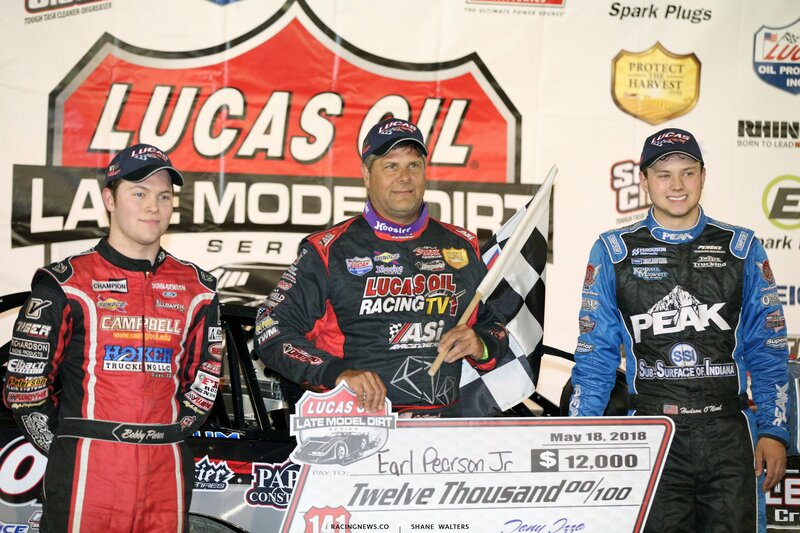 Earl Pearson Jr wins at 141 Speedway! He jumps in the pond to celebrate in a chilly night in Wisconsin. The tour heads west tomorrow night. 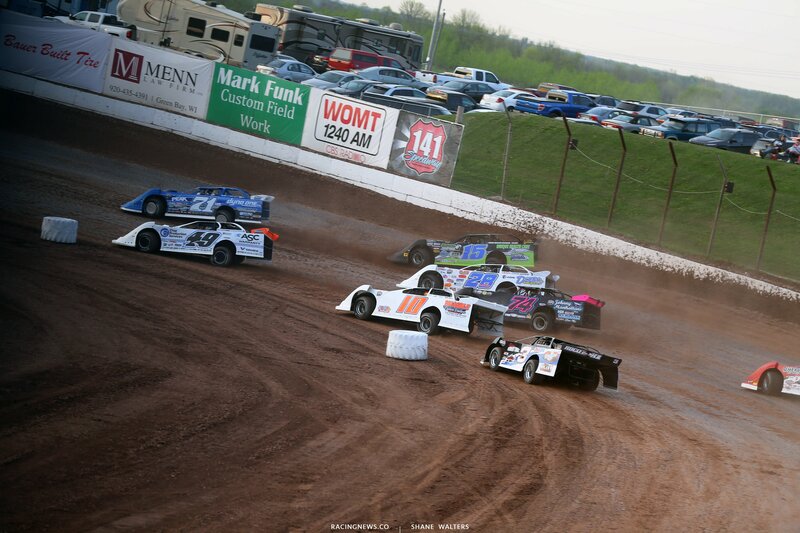 The Lucas Oil Late Model Dirt Series will unload in Spring Valley, MN at Deer Creek Speedway. 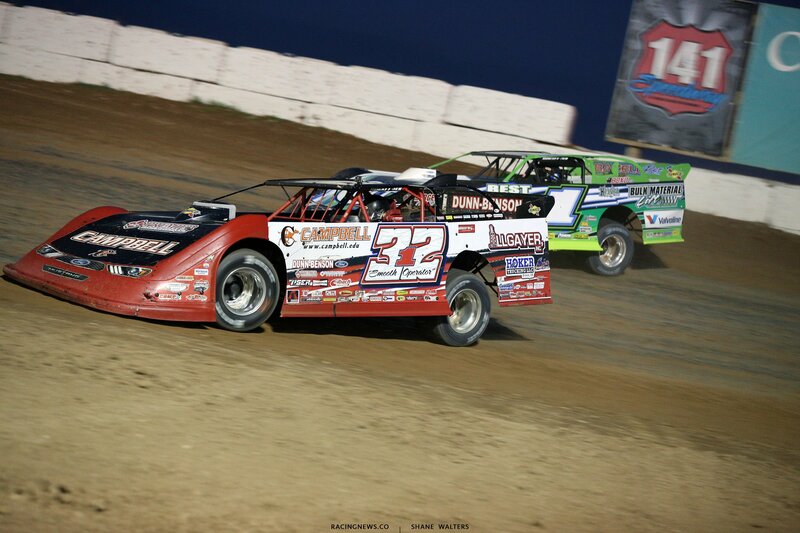 Sunday night the dirt late model drivers will return to I-80 Speedway in Greenwood, NE.